Perform "Inspection After Repair" after replacing the piston or piston ring (See page ). (a) Using an E8 and E10 "TORX" socket wrenches, install the stud bolts. (a) Using a 5 mm hexagon wrench, install the 4 oil nozzles with the 4 bolts. (a) Using a 5 mm hexagon wrench, install the 2 oil nozzles with the 2 bolts. (b) Gradually heat the piston up to 80 to 90°C (176 to 194°F). (c) Coat the piston, piston pin and connecting rod with engine oil. 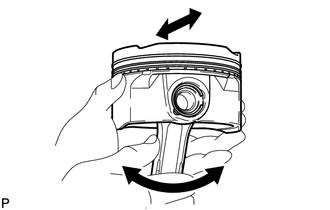 (d) Align the front marks of the piston and connecting rod, insert the connecting rod into the piston, and then push in the piston pin with your thumb until the pin comes into contact with the snap ring. (e) Using a small screwdriver, install a new snap ring on the other side of the piston pin hole. Be sure that the end gap of the snap ring is not aligned with the service hole cutout portion of the piston. (f) Check the fitting condition between the piston and piston pin. (1) Move the connecting rod back and forth on the piston pin. Check the fitting condition. If abnormal movement is felt, replace the piston and pin as a set. (2) Rotate the piston back and forth on the piston pin. Check the fitting condition. 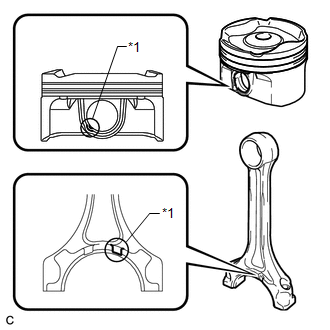 Perform "Inspection After Repair" after replacing the piston (See page ). (a) Install the oil ring expander and oil ring by hand. 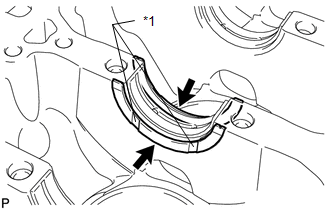 Arrange the oil ring ends and coil joint as shown in the illustration. (b) Using a piston ring expander, install the No. 1 compression ring and No. 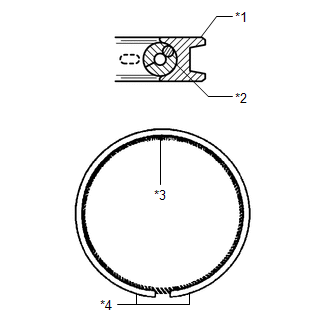 2 compression ring with the code mark positioned as shown in the illustration. Install the compression ring with the code mark facing upward. 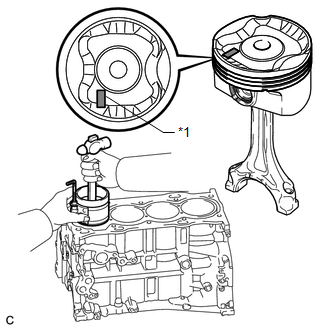 Perform "Inspection After Repair" after replacing the piston, piston ring (See page ). 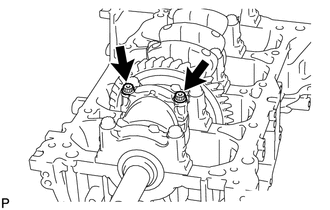 (a) Install the 2 crankshaft pulley keys to the crankshaft. (a) Clean the main journal and both surfaces of the bearing. 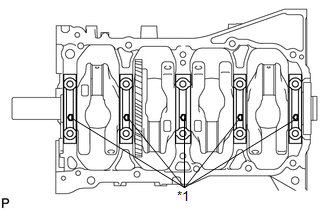 (b) Install the upper bearing to the cylinder block as shown in the illustration. Do not apply engine oil to the bearings or their contact surfaces. Both sides of the oil groove in the cylinder block should be visible through the oil feed holes in the bearing. The amount visible on each side of the holes should be equal. Do not allow coolant to come into contact with the bearing inner surface. If any coolant comes into contact with the bearing inner surface, replace the bearing with a new one. 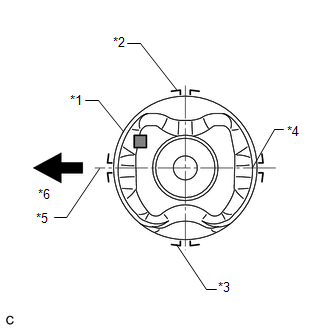 (c) Install the lower bearing onto the bearing cap. 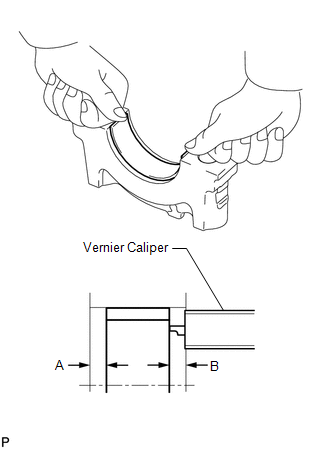 (d) Using a vernier caliper, measure the distance between the crankshaft bearing cap's edge and the lower bearing's edge. Do not apply engine oil to the bearings and the contact surfaces. (a) Apply engine oil to the thrust washers. (b) Install the 2 thrust washers onto the No. 3 journal position of the cylinder block with the oil grooves facing outward. 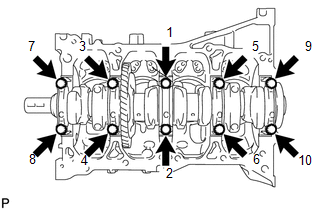 (a) Apply engine oil to the upper bearing, and install the crankshaft onto the cylinder block. 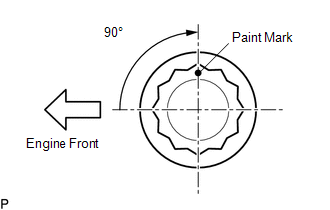 (b) Examine the front marks and numbers, and install the bearing caps onto the cylinder block with the front marks as shown in the illustration. The crankshaft bearing cap bolts are tightened in 3 progressive steps. (c) Apply a light coat of engine oil to the threads and under the heads of the bearing cap bolts. 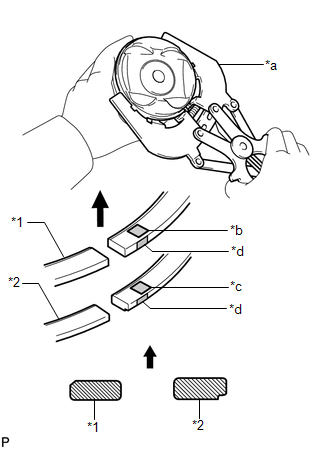 (1) Using several steps, uniformly install and tighten the 10 bearing cap bolts in the sequence shown in the illustration. 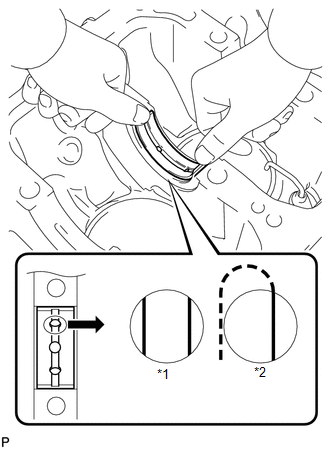 (1) Tighten the 10 bearing cap bolts again in the sequence shown in the illustration. If a crankshaft bearing cap bolt does not meet the specified torque, replace it. (1) Mark the front of the bearing cap bolts with paint. (2) Tighten the 10 bearing cap bolts 90° in the same sequence. (3) Check that the paint marks are now at a 90° angle to the front. (g) Check that the crankshaft turns smoothly. 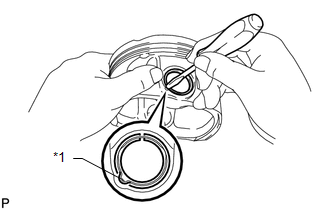 (a) Clean the bearing contact surface of the connecting rod and cap, and both surfaces of both bearings. (b) Install the connecting rod bearings to the connecting rods and connecting rod caps. 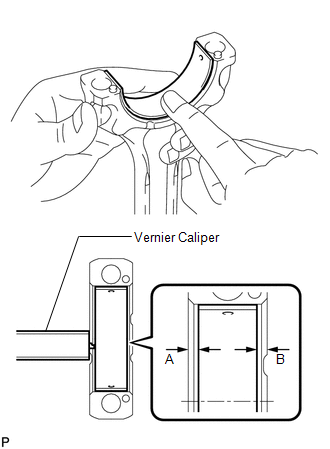 (c) Using a vernier caliper, measure the distance between the edges of the connecting rod and connecting rod bearing, and the edges of the bearing cap and connecting rod bearing. 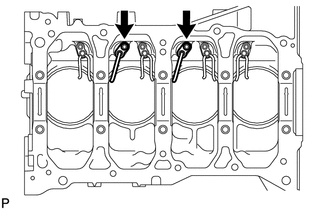 (a) Apply engine oil to the cylinder walls, pistons, and surfaces of the connecting rod bearings. 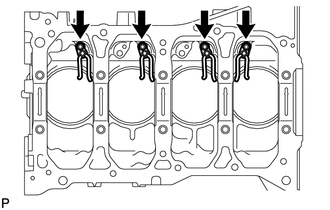 (b) Position the piston rings so that the ring ends are as shown in the illustration. (c) Using a hammer handle and piston ring compressor, press a piston with connecting rod into each cylinder with the front mark of the piston facing forward. When inserting the piston with connecting rod into the cylinder block, make sure the oil nozzle does not interfere with the connecting rod. (d) Check that the front mark of the connecting rod cap is facing in the correct direction. Match the numbered connecting rod cap with the connecting rod. 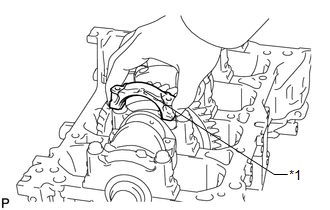 (e) Apply a light coat of engine oil to the threads and under the heads of the connecting rod bolts. (f) Temporarily install the connecting rod bolts. The connecting rod bolts are tightened in 2 progressive steps. (1) Alternately tighten the connecting rod bolts in several steps. (1) Mark the front of the connecting rod bolts with paint. 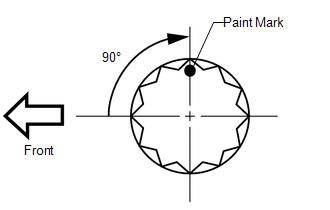 (2) Tighten the bolts 90° as shown in the illustration.